Swimmers looking for a place to cool off this long weekend can check an online guide that tracks your location and offers information on the closest, cleanest and most popular beaches. Lake Ontario Waterkeeper, a non-profit group dedicated to keeping Lake Ontario and other nearby waterways clean, operates the Swim Guide — a website and mobile app that lists four beaches nearest you, as well as four alternatives that are trending online, and whether the water at each beach is fit for swimming. As well, there's an interactive map that gives detailed information about more than 7,000 beaches all around Canada, the U.S., Mexico and even New Zealand. 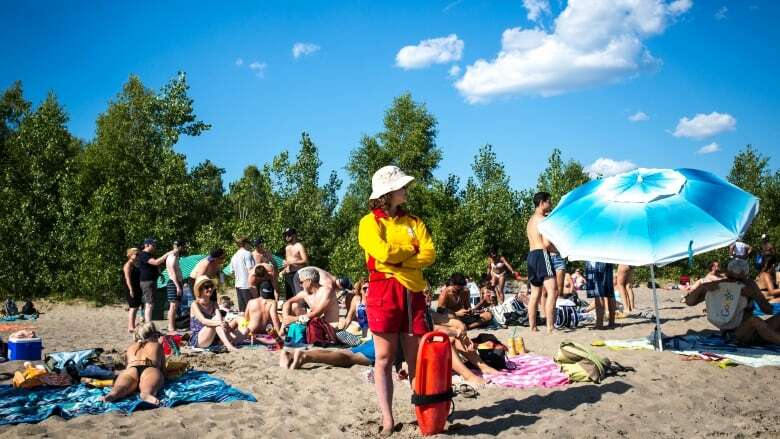 "People were always asking us if the beaches are safe and we found it's hard to find because you have to check every public health website," said Lake Ontario Waterkeeper's outreach coordinator Chloe Cross. "Now the Swim Guide has all that info in one spot." The group launched the website and app in 2011, but it originally offered only basic information about water quality at about a thousand beaches in Toronto and around the Great Lakes. The most recent version, offering far more detail, was launched earlier this summer. Once a user has clicked on the beach that's of interest, a new page gives temperature, a weather forecast, some written information about the beach itself, directions and a more detailed look at the water quality there. "People wanted to know where to go, so we wanted to gather as much information as possible," Cross said. Information about the beaches on the site is provided by the group's affiliates around the world.